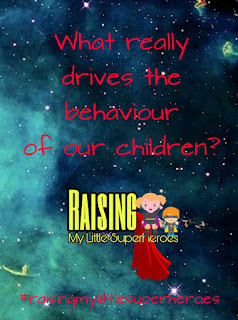 Raising My Little Superheroes : What really drives the behaviour of our children? 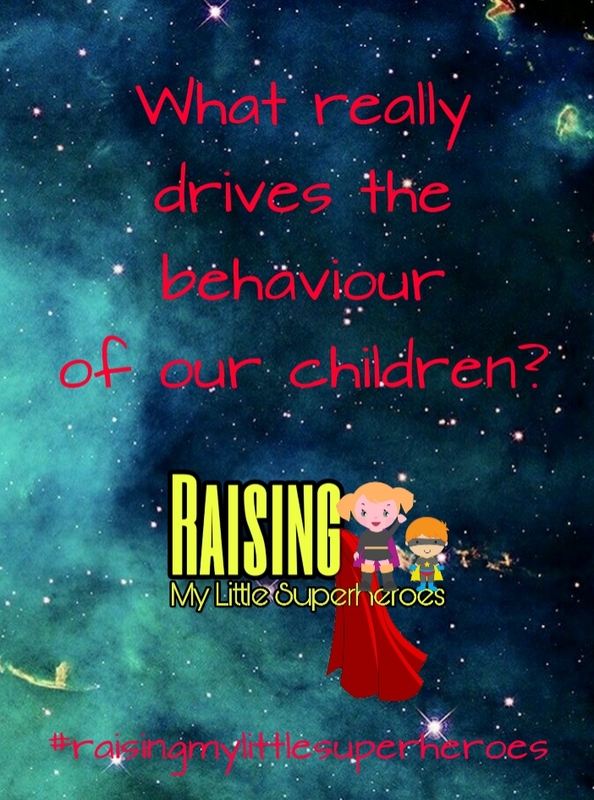 Since the beginning of time, parents, educators, care givers and so on, the world over have found themselves often perplexed over what drives the behaviour of their children, especially when the behaviour is challenging. Picture this - cave parents pulling their hair out because their cave baby is crying at three in the morning and they cannot figure out what the issue is! Well maybe not from the beginning of time but perhaps fairly close to it! Most parents figure out just how difficult it can be to interpret behaviour very early on - think back to day one of becoming a new parent! From day one of being earth side, babies express their needs and wants through crying and other noises, but mostly crying! When you really listen to a baby crying and making noises in general (and parents are great at doing this!) you'll notice that the noise that they make will differ depending on what they need - hunger, thirst, tired, bored, over-stimulated, happy and so on. A baby will cry to "tell" us what they need or want. Until a child begins to develop their language skills, they will continue to express their needs and wants through crying and other means. Even after their language skills have begun to develop, behaviour can still be perplexing. And if your child is frequently distressed, as L was as a baby and toddler, parenting can become even more confusing and frustrating as you try to read, interpret and meet your child's needs and wants. Behaviour IS done FOR a purpose. The purpose is often done to serve as a means of communication. Our role as a parent or educator or care giver, is to figure out just what our children are trying to communicate to us! I've had many discussions with various people over the last three years about the above statement and quite often have heard "but when a child is exhibiting attention seeking behaviour, there is no purpose." I beg to differ! All behaviour, including attention seeking behaviour, is done for a purpose. Attention seeking behaviour is usually done wilfully and is quite often within a child's control. BUT it is still serving a purpose - to gain attention from an adult or from other children. There are numerous other reasons behind a child's behaviour including sensory driven behaviour. Sensory driven behaviour is exhibited in response to input from the child's environment. Quite simply, sensory driven behaviour relates to how our brain takes in, analyses and responds to sensory input from and through all of our senses - quite often known as sensory processing difficulties. Both O and L have sensory processing difficulties - they are both over-responsive and under-responsive to a host of different sensory input. Quite often O and L will end up in a state of meltdown due to the overload of sensory input bombarding their bodies. When they enter into this state of meltdown, they are not aware of their actions or words - their brain takes over with the fight/flight/freeze response to get them as far away from the sensory overload as possible. A meltdown is a form of communication - in that moment O and L are physically unable to find the words that they need to tell us what is happening, hence the screaming, yelling of non-sensical sounds, the thrashing about and the lashing out. Likewise a tantrum is also a form of communication however a child throwing a tantrum is in control of their actions. A tantrum can be started and stopped at will. There is a YouTube clip that I have seen numerous times that shows a young child stopping and starting a tantrum as soon as he sees his parents. It illustrates that a child throwing a tantrum is in fact in complete control of their actions. Here is the link if you wish to check it out! A tantrum can be called a learnt behaviour. From very early on, children learn various behaviours in the hope of eliciting a desired outcome from their parents - smiles, pouting, stomping their feet, puppy dog eyes and so on. A tantrum is a conscious behaviour as the child chooses to act in that particular way and is in control of their body the entire time. A tantrum has a defined want. A tantrum may start over a desire to want something (a lolly in a shop) or to get out of doing something (going to bed.) During a tantrum a child will often look at their parents to gauge their reaction and a tantrum can be stopped and equally started again with ease. During a tantrum a child may try to negotiate with you or make demands. You can reason with a child throwing a tantrum - it may not work, but you can reason with them. 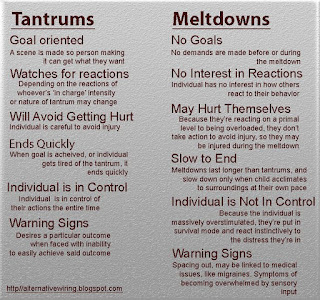 A tantrum will often stop when the child either gets their own way or when they realise that they aren't getting the reaction that they wanted. 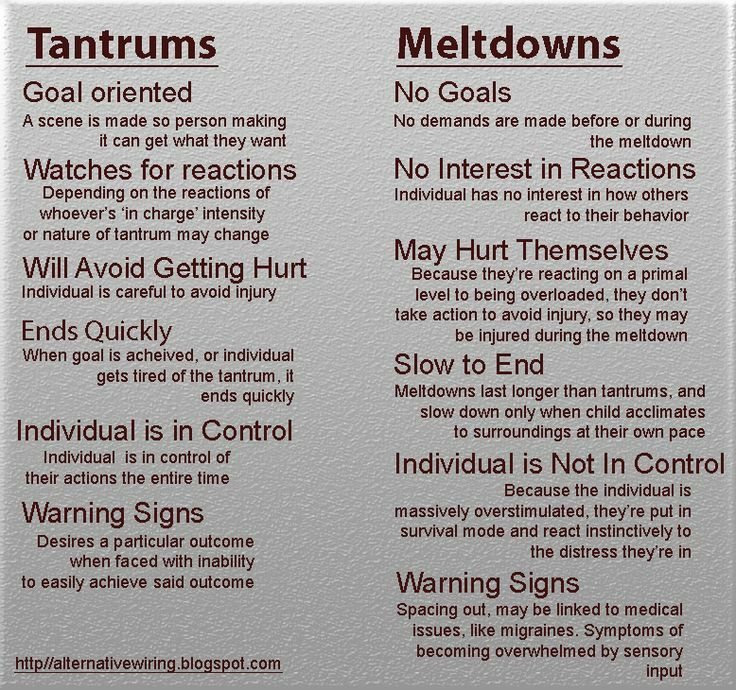 It is vital that you know the difference between a meltdown and a tantrum as how you respond to both will differ. It is also important to note that a child can throw a tantrum but end up in a state of meltdown. Both O and L have meltdowns on a regular basis but they are also known to throw almighty tantrums. And they really, really dislike it when I remind them when they are in the midst of throwing a tantrum, that I can tell the difference. How you respond to a child in a state of meltdown is completely different to how you respond to a child throwing a tantrum. If you give in to a child throwing a tantrum, you are reinforcing to the child that to get what they want (for example a lolly at the shops) all they have to do is throw another tantrum. A child who is in a state of meltdown needs to know that you are there for them. One of the tricky parts with any behaviour that a child is exhibiting is working out what the child is trying to tell us. At times, it is incredibly easy to work out what they are trying to communicate to us. At other times, it can be very difficult. It can be helpful to start a journal noting the date, time and activity that the child was engaged in prior to the behaviour being shown and/or what the child was asked to do prior to the behaviour beginning. You may start to notice patterns in your child's behaviour. You may start to notice that your child is triggered by particular environmental factors - noise, bright lights, foods and so on. A journal can be particularly helpful if a child's behaviour is beginning to disrupt their daily routines or the frequency or intensity of the behaviour are becoming on the extreme side of the scale. Once you have worked out what purpose the behaviour is serving, you can then come up with a plan to manage the behaviour. If you ignore an attention seeking behaviour, the child may become bored and stop as they're not getting the reaction that they want. Is the child sitting on the floor fidgeting with her shirt anxious? Telling her to stop fidgeting is going to make the situation worse. That child may need assistance in recognising her own anxiety and managing the anxiety. The child who is screaming in the playground may not yet have the skills to understand sharing or turn taking and is becoming frustrated at other children not giving them the toys that they want. Perhaps we need to teach this child about sharing and turn taking. There are some skills that you too can do to assist a child with their behaviour. What YOU can try to do is to remain calm. A child in distress needs calm. I will be the first to admit that it is incredibly difficult not to respond to a child with emotion but chances are that if you respond to a screaming child with yelling, the situation will become a lot more intense. 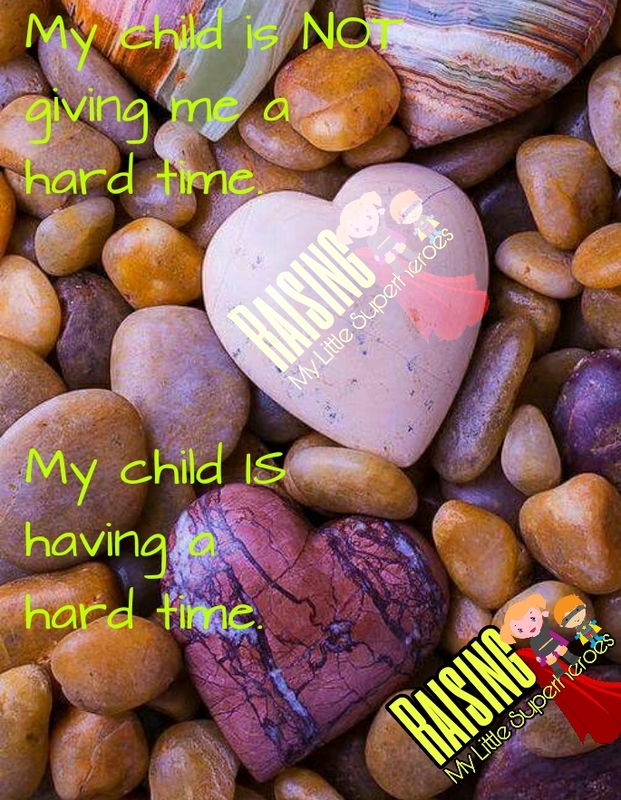 Remember, that your child is not giving you a hard time. Your child may be having a hard time. A hard time dealing with the sensory input. A hard time communicating to you with words what their needs and wants are in that moment. 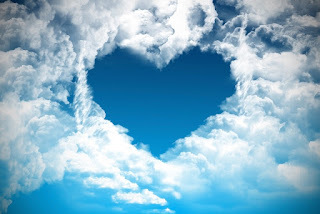 Take a deep breath, or two, before you start to respond to your child. Ground yourself so that you can try to remain calm. If the behaviour is too challenging for you, walk away and re-ground yourself before going back in for round two, or three! 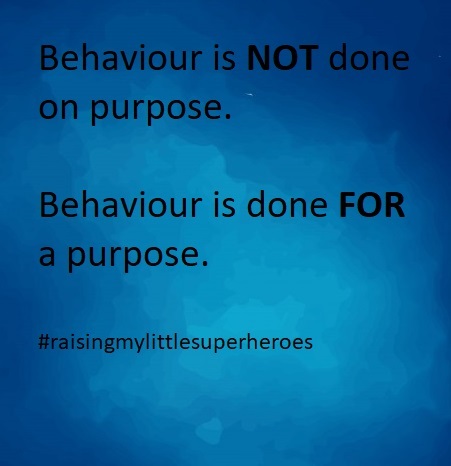 And above all remind yourself that your child is not doing the behaviour on purpose. They are trying to communicate with you.